Borders conference held in Dubai. 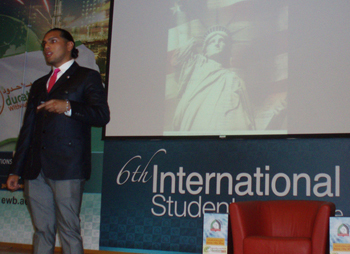 TAMPA, Fla. -- USF Student Body President Cesar Hernandez went to Dubai last week determined to make a powerful statement about American immigration policy not fully realizing that he was in the midst of a prestigious international competition that would pit him against great young minds from universities like Cambridge and Yale. But when Hernandez, a dynamic speaker known for setting a crowd on the edge of their seat was done challenging the audience to think about how the millennial generation will handle immigration challenges, he’d topped all other students in the event’s policy category. A large crystal trophy and a laptop computer were the spoils he lugged back to Tampa. Hernandez was one of 13 University of South Florida students led by Office of Sustainability Director Christian Wells and Office of National Scholarships Director Linda Lucas to attend the biennial conference that drew students from more than 300 universities in 140 countries. The event is designed to connect students from across cultures to share ideas and solutions on global challenges. For Hernandez, the event was an opportunity to speak on an international stage about a topic that is close to his heart and consumes much of his scholarly time. The son of parents who fled Guatemala, Hernandez has filmed a documentary exploring the immigrant experience in America and lobbied for passage of the Dream Act, proposed federal legislation which would create a path for citizenship for students who were brought to the United States as small children and now lack immigration status as they near adulthood. The documentary shows immigrant stories from New York City, Tampa Bay, Orlando and the U.S.-Mexico border towns of El Paso, Texas and Ciudad Juarez. Its aim, he said, is to not only educate people and policymakers about what drives immigration but also discuss alternatives and possible solutions to the illegal immigration. The documentary is a collaborative effort between with AMIGOS organization and the Seraph Foundation. Hernandez’s win -- now drawing him attention from graduate programs worldwide -- also is bringing new attention to USF’s standing as a globally-engaged university.